OAKA Stadium, in full Olympic Athletic Center of Athens “Spiros Louis”, got built between 1980 and 1982, and opened on 8 September 1982 with the European Athletics Championships. 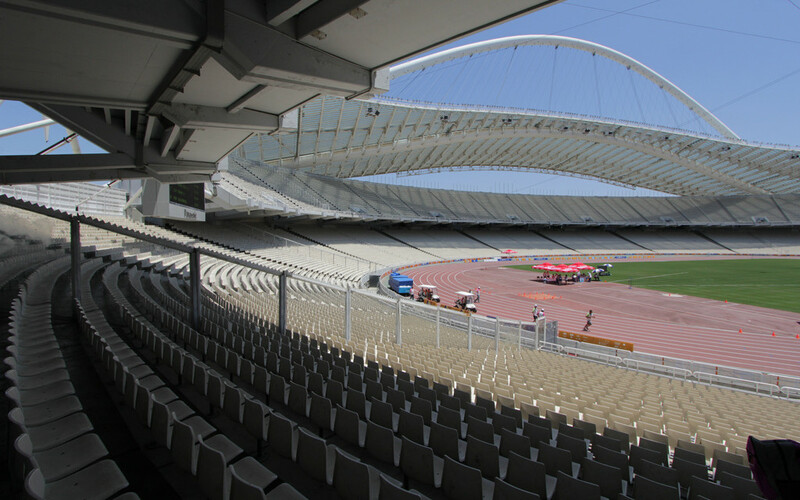 The stadium was named after Spiros Louis, the Greek winner of the first Olympic marathon in 1896. One year later, in 1983, OAKA Stadium hosted the European Cup final between Hamburger SV and Juventus (1-0). In 1987, the stadium hosted the Cup Winners’ Cup final between Ajax and Lokomotiv Leipzig (1-0). 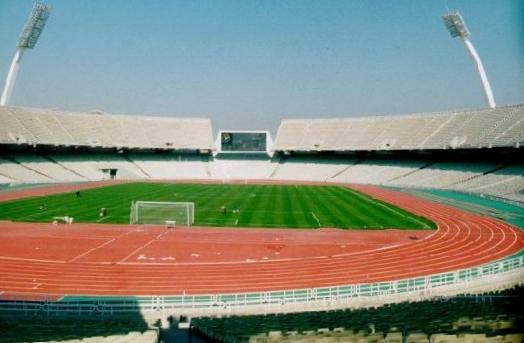 In 1984, Panathinaikos moved into OAKA after their Leoforos Stadium had fallen into disrepair. AEK used the stadium between 1985 and 1987, but then decided to move back to their Nea Filadelfeia. 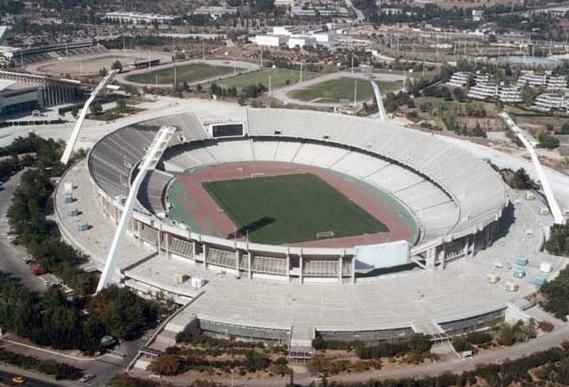 In 1994, OAKA Stadium hosted their second European Cup final, this time contested between AC Milan and Barcelona (4-0). 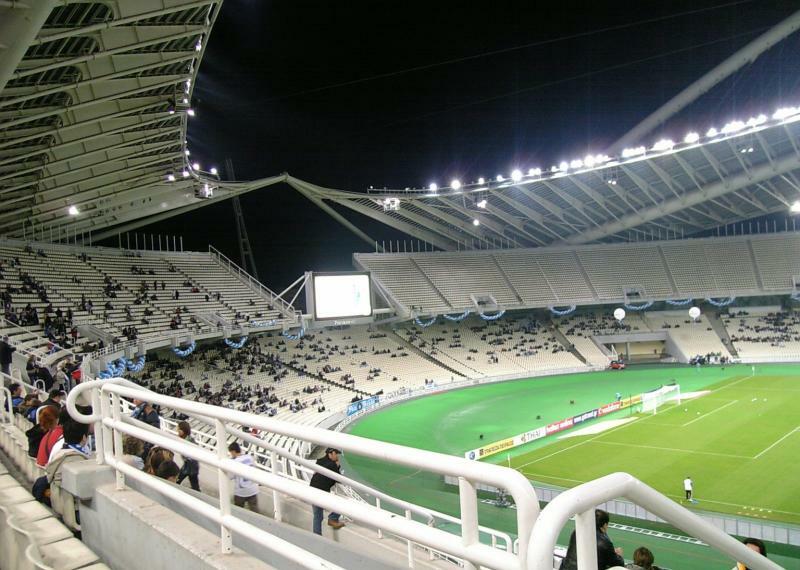 Panathinaikos moved back to the upgraded Leoforos in 2000, and soon after works started to redevelop OAKA Stadium for the 2004 Olympics. Its most striking new feature was the roof designed by Spanish architect Santiago Calatrava. During the games, the stadium hosted, among others, the opening and closing ceremonies and the athletics events. 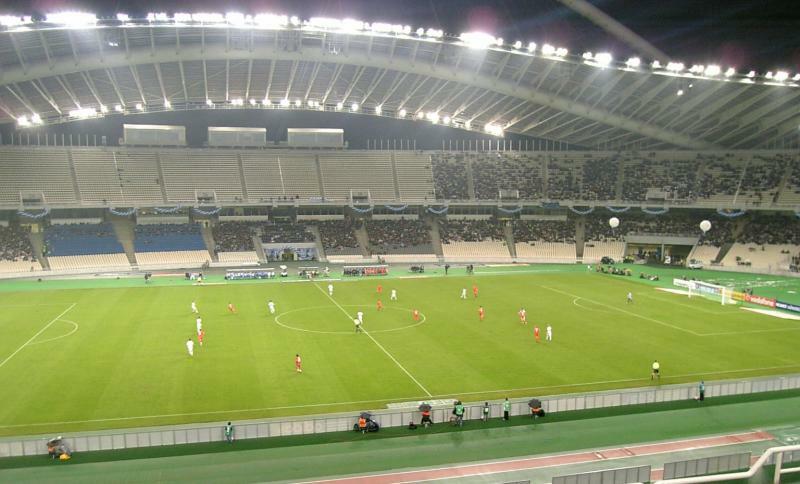 In 2007, OAKA Stadium hosted the Champions League final between AC Milan and Liverpool (2-1). 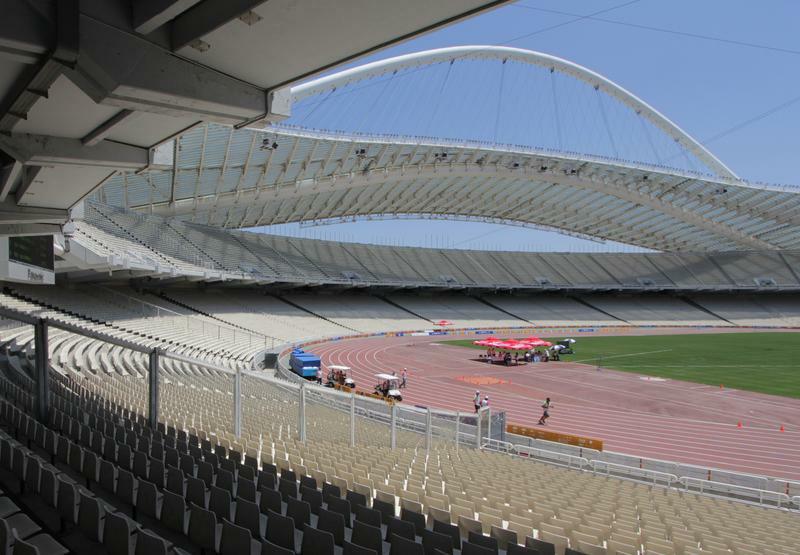 After the Olympics, both AEK and Panathinaikos had moved back into the stadium as their own stadiums had again fallen into disrepair and failed to pass safety requirements. Both clubs made plans to build new stadiums, and AEK even demolished Nea Filadelfeia, but plans each time got stuck on a lack of funding. AEK recently once again presented plans for a new stadium, Agia Sofia Stadium, but planning procedures are still ongoing. While Panathinaikos did not manage to get a new stadium project off the ground either, they did manage to patch up their Apostolos Nikolaidis Stadium sufficiently to move back in in 2014. OAKA Stadium is part of the Olympic complex that is located in the Maroussi area in the north of Athens, about 9 kilometres from Athens city centre. The stadium can be reached by metro. Stations Irini and Neratziotissa on line M1 lie at close distance from the Olympic complex. Line M1 runs straight through Athens city centre. The area around the Olympic complex is mainly residential, though right next to the stadium lies the luxurious Golden Hall shopping mall. A little further toward the north, near the Neratziotissa metro stop, lies The Mall Athens shopping centre, which offers significantly more in terms of eating and drinking, as well as a cinema. You may find the odd café or restaurant in the adjacent neighbourhoods, but otherwise you may want to focus on Athens’ city centre for eating and drinking. The city centre is also where most of Athens’ nightlife is, though part of it moves to the southern beaches (e.g. Glifada) for the summer. If you wish to stay close to the stadium, there are a few hotels around. The Civitel Olympic and Athens Habitat are located near the Golden Hall, but do not come cheap. The Olympic Hotel is located slightly further away, but is somewhat more affordable. The Civitel Attik is another option. It lies north of the stadium near The Mall. Click here for all hotels near OAKA Stadium. If you plan to spend more time in Athens, then staying in the city centre is likely a better idea. Click here for the options, which are generally quite a bit cheaper than near the stadium. Tickets for AEK matches can be bought online, by phone +30 801 100 2121, at the Ticket Office at OAKA Stadium, or at one of the club’s two Fan Shops, which both lie in the suburbs far out of the centre. Tickets can also be purchased on the gate on the day of the match. Ticket prices typically start at €10.00 for a seat behind the goal. Tickets for the long sides cost either €15.00 or €40.00, and VIP seats go for €100.00. Aekfc.gr – Official website of AEK FC. 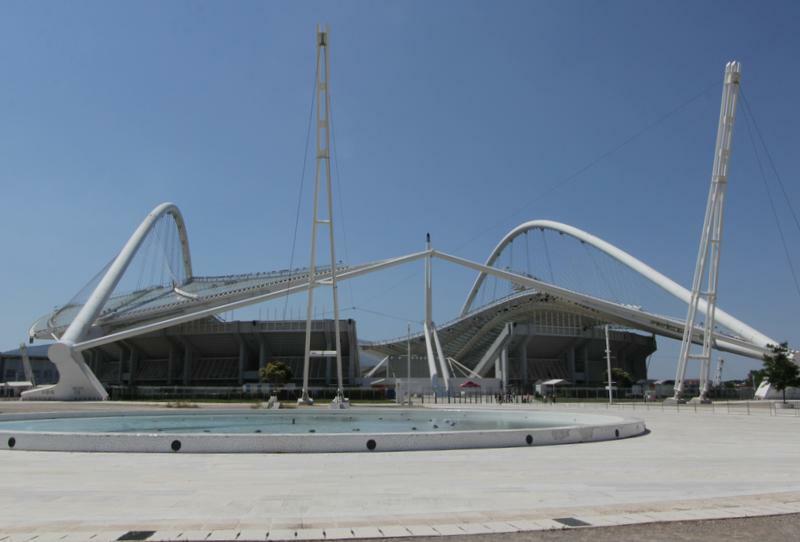 Oaka.com.gr – Official website of the OAKA Olympic Athletic Center. Ametro.gr – Information on the Athens metro.